Today my girls will be able to see my love every time they look at themselves! I’m going to write a message on three mirrors – their bathroom mirror, my older daughter’s mirror over her dresser, and my younger daughter’s full length mirror on the back of her bedroom door. I tested this out on my bathroom mirror using a dry erase marker and it worked well, so that’s what I’m going to write with. As for the messages themselves??? I think they’ll say “I love you, (their name)” and “You’re beautiful inside and out.” I’ll share pictures later! Here’s what I put under my girls’ pillows last night. 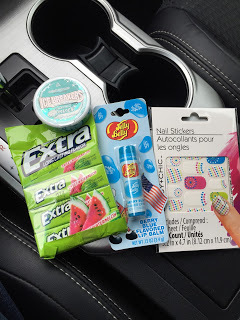 The gum and the flavored lip balm were for my 12-year-old and the mints and nail stickers were for my 14-year-old. They didn’t find them until right at bedtime! If you’ve missed earlier posts in this series, you can go to my 31 Days host page and catch up on all the ways we’re showing love to our daughters in October! Messages on mirrors are fun! And I like what you got for your daughters; I bet they loved finding those treasures under their pillows. My older daughter said she got scared because she heard a crinkling sound when she pulled back her sheet and wasn't sure what was going on! 🙂 But yes, they both liked their "treasures."